The 5000 m2 fenced property includes olive trees, oak trees, spacious lawns and a large swimming pool, open from May to September, with a delightful view of nearby Castiglion Fiorentino. The pool is surrounded by gardens filled with lavender and rosemary. There, you will find comfortable lounge chairs for your relaxing pleasure and an outdoor shower. Pool towels are included in the rental rate. The pool is shared with other guests (max 3) who occupy an apartment in the villa. Three touring bicycles are available to guests who might enjoy a slower paced, albeit challenging, exploration of the nearby countryside. 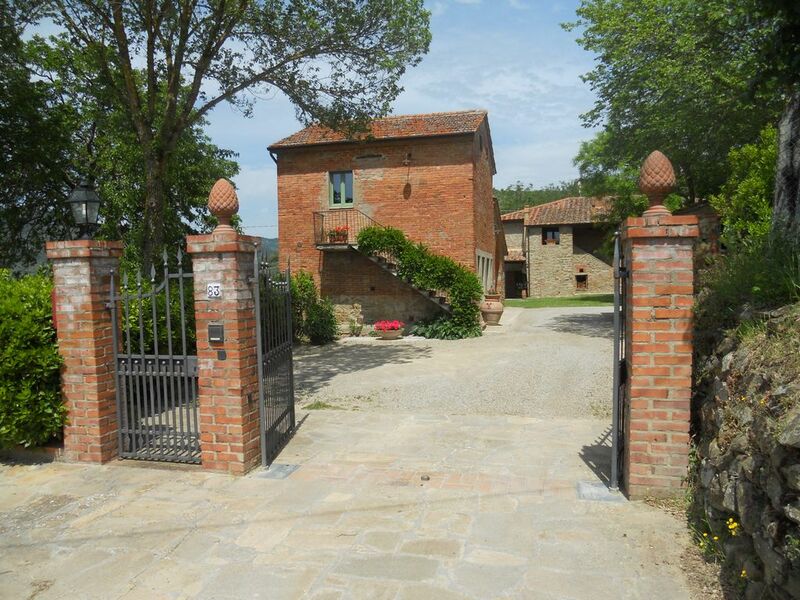 The house is on a hillside, overlooking olive groves, rural farmland, and the medieval town of Castiglion Fiorentino. laundry area with washing machine at the ground floor of the owner’s house located on the same property. A drying rack for clothes is provided. Swimming Pool: 6 x 12 m (18 x 36 ft) shared with other guests (max 3) who occupy an apartment in the villa. The pool is open from mid-May to mid-October. We may extend the opening period on request. Very nice family and house. We stayed there for several days and visited Tuscany. Great location and close to train and highway. Would definitely stay there again. Clean & comfortable cottage run by a lovely family. A lovely rural retreat with great views! Spotlessly clean accommodation with lots of practical equipment supplied. The family, Fausto, Flavia and Anna couldn’t have been more helpful or welcoming, such lovely people! Great location to see surrounding towns and cities. We had a cookery lesson which was great fun - learning how to make pasta. The pool was lovely, the kitchen well equipped and the beds comfortable. The only downside was the mosquitoes! We stayed for 7 days in August - a family of 4, including two girls aged 11 and 14. The property was beautifully furnished and included all the extras needed (fans, pool towels, kitchen pans, hair dryer, iron etc). The family gave us a very friendly welcome and were always available for any queries. The view from the terrace is stunning and the pool is beautifully laid out also. We were able to visit lots of interesting towns and Siena/ Florence/ Perugia easily from this location and we loved the region. We would definitely recommend this cottage and the area to other families planning a holiday. Our stay in Castiglion Fiorentino far exceeded our expectations. Anna, Fausto, and Flavia were very kind and made sure we were as comfortable as possible. Their hospitality made us want to stay forever! We traveled from Los Angeles with our family of 4 and arrived very tired and hungry. They made sure we had everything we needed to recover from our long travels and pointed us in the right direction for local grocery stores and restaurants in the city center. The scenery was breathtaking and we enjoyed the sunset every night on the lawn with a glass of wine. We will be back! Had a wonderful stay in the well equipped cottage. We were only staying as a couple with our baby but it could easily accommodate a larger family or two couples. Ciao Michael e Sara, many thanks for your kind words, we are really happy you enjoyed your holidays at our cottage. send a ciao to Eva.